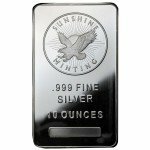 One of the most commonly available sizes of silver bars are the 10 ounce variety because they are great for both adding to an investment as well as beginning an entirely new one. 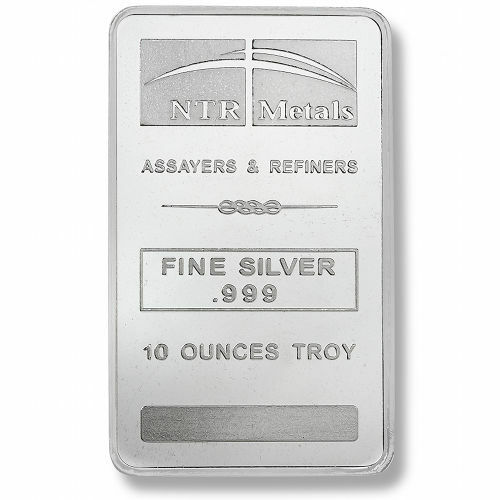 This 10 oz silver bar produced by NTR Metals is one that has just recently stepped foot in the bullion industry, but is quickly gaining a large fan base. 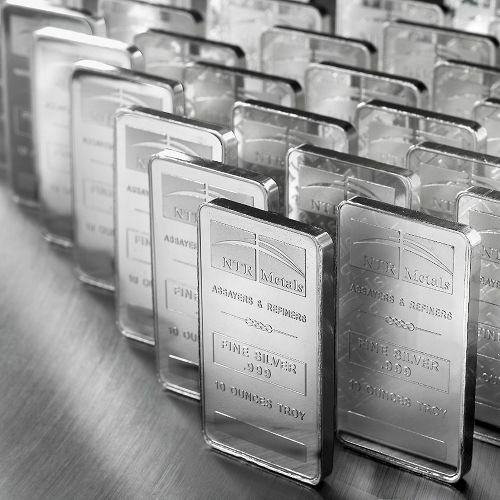 Because larger sized silver bars such as the 10 oz are commonly sought out due to their high silver content and lower premiums, the NTR bar has become a popular choice for investors mainly due to its straight-to-the-pint design and low price per ounce. Minted at North Texas Refinery Metals in the USA. Design features the NTR logo. 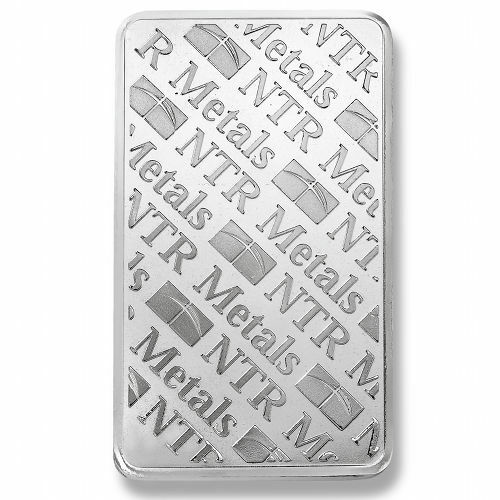 The design of 10 oz NTR silver bar is in line with most other silver bars on the market today. The front of the bar boasts just the 10 ounce weight, .999 purity, and a simple rendition of the NTR mint mark. The reverse side of this silver bar features a derivative of the NTR logo fixated in a repeating diagonal pattern. Rather than the bars features being pressed into the bar, things like the mintmark and purity markings are raised slightly off the face of the bar. This raising of the images provides a wonderful contrast between burnished silver and matte silver. The history of NTR, otherwise referred to as North Texas Refinery, can be traced back to recent history as the company was founded shortly after the turn of the 21st century. Even though they have not even been in business ten years, NTR has expanded its reach into a number of different industries with a corporate and industrial presence all over the globe. 10 oz NTR silver bars are packaged in plastic sheets and are sealed from the day they leave the mint. When they are shipped discreetly to you from Silver.com, they will remain in their plastic and oftentimes be placed in another baggie or wrapped in bubble wrap to ensure the product’s safety during transit. If you would like to learn more about us, our products or anything else we encourage you to call us at 888-989-7223 or send us an email. NTR bars. Easy to hoard, easy to move if things go bad. 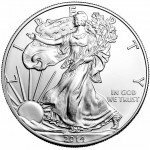 No frills but 10 oz of shiny Silver. Banks are not going to look out for you financial future, it’s up to you to make sure your assets are at your fingertips when you need them, that’s independence. Make ready for what’s to come.